The Gathering of Leaders 2017 Lead Video from Hiker on Vimeo. 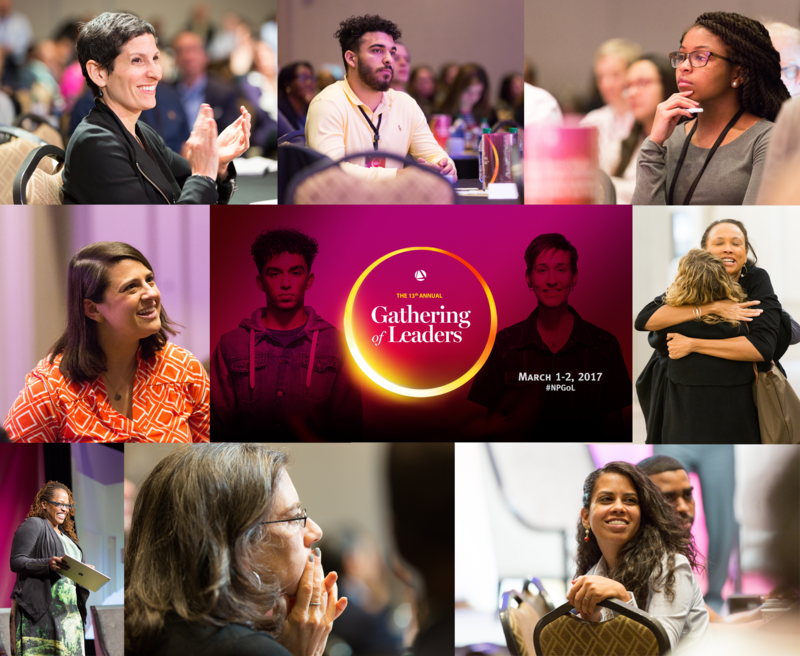 Below you will find the full, video-linked agenda from the 2017 Gathering of Leaders, which was held in Atlanta at the beginning of March. Follow along on Facebook and Twitter with #NPGoL as we reflect on our time in Atlanta and chart the course ahead for making progress on our country's greatest social challenges. “ATLANTA.” Asked what that brings to mind, people of all ages and from across the country often cite with pride the work of Dr. Martin Luther King, Jr. & Sr., The Honorable Maynard Jackson, and others who pushed our country to new heights through earlier periods of our nation’s great movement for civil rights. That story—the bedrock of this great city—is ever-present and still critical to understanding “the city too busy to hate.” Often overlooked is the equally inspiring and essential social movement unfolding in our great city and across the region today. Atlanta stands as a beacon of hope with legacies of generations past continuing the work of progress, justice and love. The city of the historical Auburn Avenue and Black business independence, one of the highest concentration of HBCUs in the country, and the 1996 Olympics, is also the city struggling with under-resourced communities, a trauma center contending with the uninsured and under-insured, and homelessness that has women and children as its largest population. Funders and fundraisers both feel great urgency to drive impact. Paradoxically, though each needs the other, their relationships with one another can stand In the way of achieving the results each aims for. Our next two discussions will help us unlock greater social change for funders and their partners alike. Part I: Diversity, Equity, Inclusion and Funders Over the past few years, racism and other forms of bias inside the social innovation field have taken center stage at the Gathering—along with examples of how social entrepreneurs and service delivery organizations are tackling them. Now we’ll extend the conversation to funders, with fresh data on the Gathering community from the recent survey led by our partners at Deloitte to kick us off. Part II: Privilege, Power, and Vulnerability in Funder-Grantee Relationships It’s old news that funders’ priorities can pressure grantees in ways that compromise their ability to drive impact. But funders also experience compromising pressures and grantees have more power than they may know. What could we accomplish if we could struggle with these pressures together? What if shared vulnerability and transparency could add rocket fuel to funder-grantee partnerships? What would this transformation look like in action? To achieve large-scale, sustained social change that impacts fundamental levers of opportunity, we must wrangle with systems. This is as true for social entrepreneurs as for policy advocates, community organizers, or leaders of social movements. Yet we – the GOL community – lack a broadly shared set of tools to understand or talk about this work, which makes it hard to do well. It feels squishy. It’s hard to explain, and seems harder still to measure. For these reasons, it’s often a struggle for funders to get behind it. Training the insights and experiences of two leading practitioners on the real-time challenges of Health Leads’ endeavor to transform health care, we’ll build systems change muscles as a community. What is systems entrepreneurship? What does it look like in action? How does it relate to the work of building an organization? To policy-advocacy? To creating social movements? And who’s a systems leader, anyway?